In a recent ceremony in Warsaw, Poland, government officials unveiled the portraits of 66 Polish Special Forces soldiers who had been killed in the Global War on Terrorism. The soldiers were killed while working with American Special Forces. Twenty two soldiers were killed in Iraq, and the remaining number died in Afghanistan. The portraits were drawn by Post member Mike Reagan, which he donated to the Polish government. The portrait presentation was the highlight of a ceremony that established a National Remembrance Day of Fallen Veterans. The framed portraits will remain on permanent display in the newly established Polish Veterans Museum. 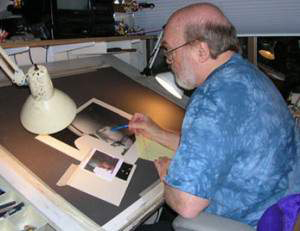 In 2003, Mike established the Fallen Heroes Project, and since then, he has drawn more than 4400 portraits for the families who have lost loved ones in our nations’ Global War on Terrorism. Thanks to Mike’s compassion, he has brought untold comfort to the members of our nation’s Gold Star families. Mike has also honored the memory of deceased members of our Post by presenting portraits of them to family members. 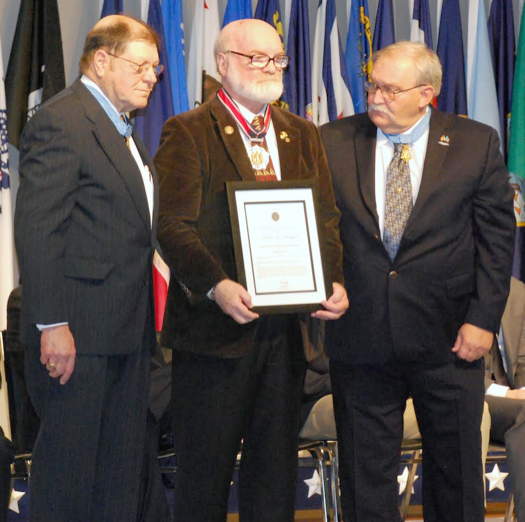 At a recent ceremony held at Arlington National Cemetery, Michael Reagan, an active and loyal member of our Post, was awarded the Citizens Before Self Honor Medal. 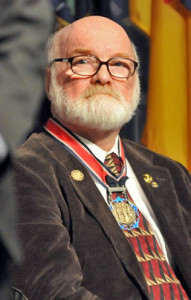 Referred to as the Civilian Medal of Honor, this prestigious medal was awarded to Michael by the Medal of Honor Foundation, an organization comprised of recipients of our nation’s highest military medal, the Congressional Medal of Honor (MOH). This recognition is one of the highest and most prestigious awards that is bestowed on private citizens. The Medal of Honor Foundation was founded in 1999 for the purpose of perpetuating the legacy of the MOH through outreach and educational programs. 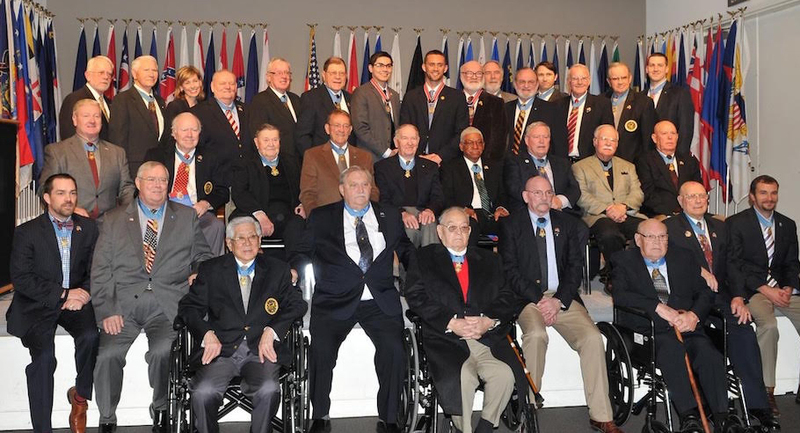 The program to honor private citizens was created to recognize those ordinary Americans from across the country who perform extraordinary acts of courage or through a continued commitment to service by placing the needs of others first. Michael was selected as a 2015 honoree “for his service in founding the non-profit Fallen Heroes Project, which provides hand-drawn portraits to the families of all servicemen and women who have been killed in Iraq and Afghanistan”. Michael is a Seattle native, and following his high school graduation, he enlisted in the U.S. Marine Corps. Following a combat tour of duty in Vietnam, he attended art school. He worked as a graphic arts designer for the Seattle Public Schools, which led to a position at the University of Washington, an affiliation that remains today. Michael is a portrait artist, and during his 40 year career, he has drawn over 10,000 portraits of celebrities, professional athletes, U.S. Presidents, as well as other heads of state. Early in his career, Michael made the decision to use his skill and reputation as a much sought after portrait artist to perform charitable work for a wide range of benevolent organizations such as Boys and Girls Clubs, Children’s Hospital, the Humane Society, and the Fred Hutchinson Cancer Research Center. To date, his signed celebrity portraits have raised over $10 million for these deserving organizations. Mike appears with this year’s class of recipients, fourth row up, fourth from right. At the age of 17 and with the permission of his parents, Dennis Gaasland joined the Navy to serve his nation during WW II. Trained as a radar operator, Dennis also served in a combat amphibious unit. While serving in the Pacific, Dennis was sent to the Solomon Islands, New Hebrides Islands, Guadalcanal, and the Russel Islands before his convoy participated in the landing at the Gulf of Leyte in the Philippines. Following the war, Dennis married his childhood sweetheart, Helen, and graduated from UW with a degree in Business Administration. He was a successful businessman, working with several Seattle law firms. Dennis served at Post #8870 Commander from 1992-1994 and again from 1995-1996. He passed away in March 2015. 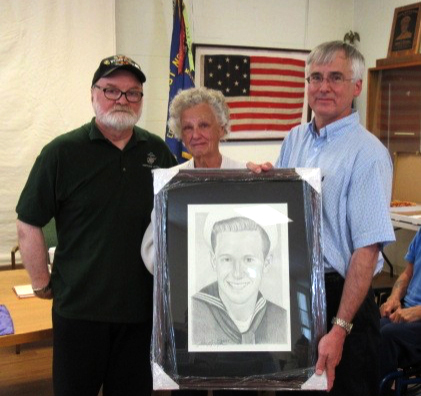 At the July meeting, Post member Mike Reagan honored the memory of Dennis by presenting a portrait of a young Dennis in his Navy uniform to his wife of more than 67 years, Helen. Also in attendance was her son, Greg. Mike, of course, is the founder of the Fallen Heroes Project, and to date, he has drawn portraits of over 4000 American veterans who have lost their lives while in service to our great nation. In his remarks, Mike assured Mrs. Gaasland that the Post would, “always remember one of our own”. Rodney Lam, Buck Weaver, Jim Harkness, Norm Goldstein, and Amos Chapman. Not shown Fred Die-trich and Dan White. 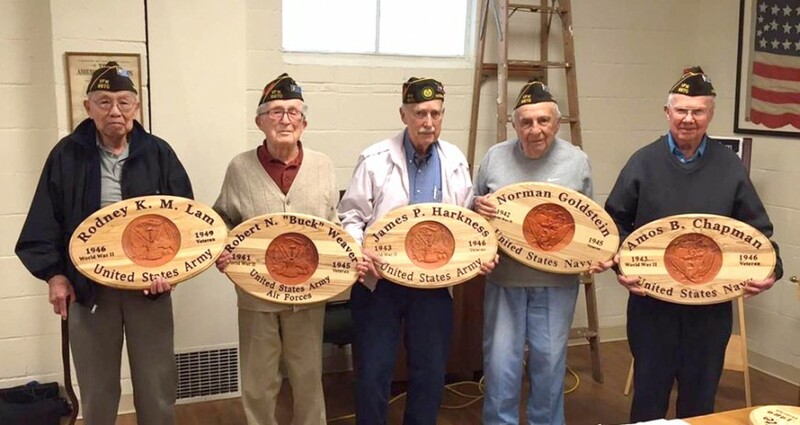 Mike Reagan donated these plaques for service to our WWII veterans. Unfortunately, Fred Dietrich and Dan White couldn’t attend the meeting and will get theirs at a later meeting. There plaques are carved by an individual in Port Angeles, as I recall, and Mike was presented one after he spoke on his Fallen Heroes Project. Mike then generously donated sufficient funds to insure that each of our WWII veterans were honored with a Plaque. The picture doesn’t do justice to the craftsmanship. At our March meeting, the Post charter was draped to honor the memory of Duane Pounds. During his many years as a member of Post #8870, Duane had served as Commander for five years and played a crucial role in keeping the Post active and successfully recruiting new members who, eventually, assumed leadership roles. Duane died on February 19 due to complications from a stroke. Julie, his wife of 66 years, had passed away last July, and Duane never fully recovered from her loss. Duane had also been an active member of many other community organizations such as American Legion Post #66, Nile Shrine Temple, Lakeside Masonic Lodge, and many others. 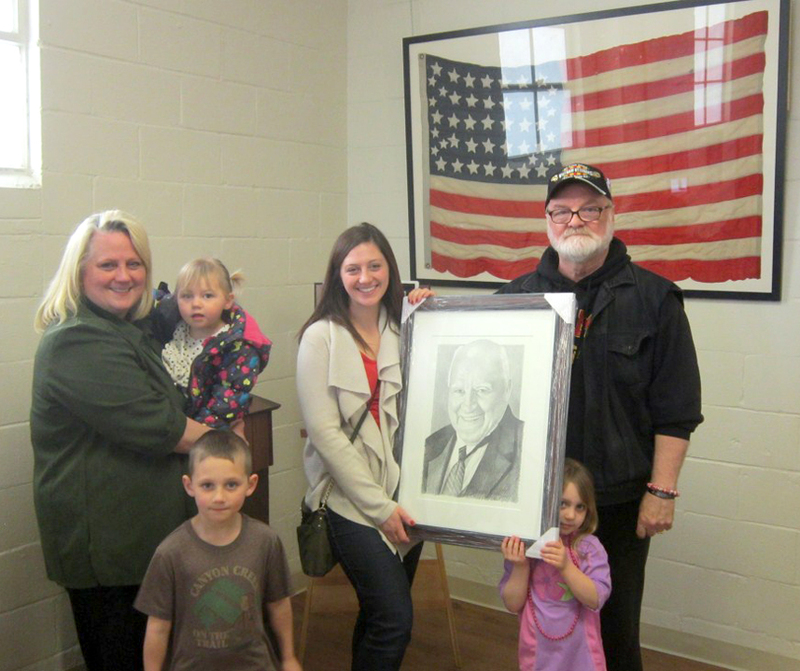 In honor of Duane’s many contributions to our Post, Mike Reagan presented a portrait of Duane to his family. Accepting the portrait on behalf of the Pounds family was Duane’s daughter, Randi, her daughter Kelly, and three of Duane’s great grandchildren. 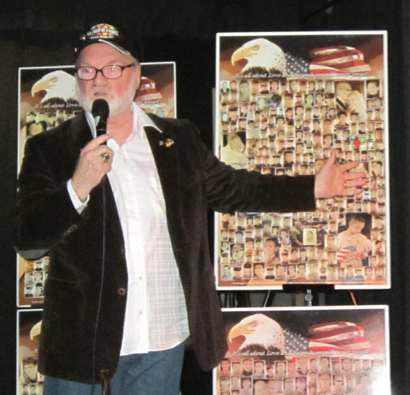 Mike, of course, founded the Fallen Heroes Project, and over the years, he has drawn portraits of over 4,000 soldiers who have been killed during our nation’s war on terrorism. Julie and Duane had five children, 10 grandchildren, and 14 great grandchildren. Where Does Our Relief Funds Go? Mike Reagan will speaking at 3rd Place Books on November 13th at 7PM. As most of you know, Mike is a member of our Post and has drawn over 4,000 portraits of service members who have lost their lives in either Iraq or Afghanistan. We strongly support the Fallen Heroes Project and Mike.